Doesn't time fly. I was going to enter this project for 'The Four Seasons' challenge over at Let's Craft and Create and just realised I've missed the deadline, the next challenge is up now - Tag It! but I'm going to show you my stamp storgage box anyway. 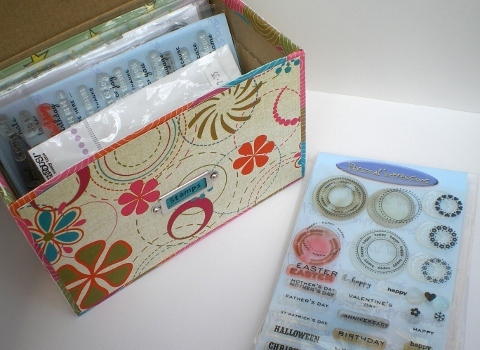 I wasn't using my acrylic stamp sets very much because they were tidied away so well, in a file, in a cupboard, behind a chair - too much trouble to get them out each time I wanted to use them. So, I needed a storage solution that could happily sit on my craft bench. I'm probably not the first one to discover that a soap powder tablet box is just the right size to hold 4 x 6 inch acrylic stamp sets. Not sure if all soap powder boxes are the same size but this one is from Asda. I haven't decorated the lid as I'm planning to cover some more and stack them. I'm washing everything in sight now trying to empty another box ready to cover. When I do I'll do a tutorial! Gorgeous box, the colours are really fresh, those soap powder boxes are addictive, every room in my house has at least 2 and they're still multiplying, luckily I have a network of friends who buy the soap powder tablets and give me their boxes lol! 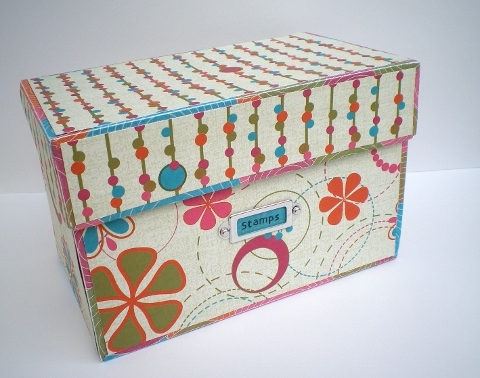 Such a clever idea Vicky, great upcycling and the perfect box to have on show!! A great storage solution Vicky - I also found that the Whiskas Cat Food boxes - the ones with the foiled food in them - are perfect for storing your A5 and square finished cards! I think I only got round to decorating one of those though!